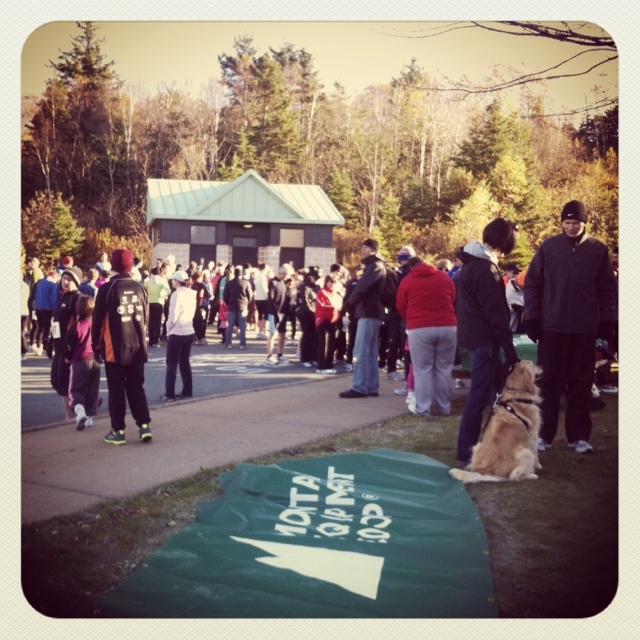 Yesterday morning I ran in Mountain Equipment Co-op’s (MEC) inaugural Annual Shubie Trail Run. 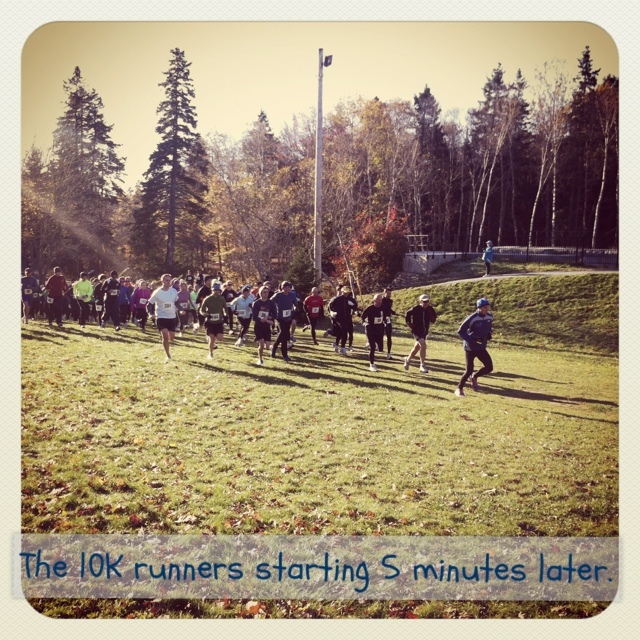 They had mapped out three routes through Shubie Park, in Dartmouth, NS: 5K, 10K and 21K (half-marathon). I ran the 5K and finished with a time of 29:15 (which isn’t possible but I’ll touch on that later). MEC has traditionally sold camping and non-urban outdoor adventuring equipment. Recently, however, they’ve expanded to include cycling equipment and are soon going to be carrying road running gear in addition to their more typical trail running stuff. That being said, even though this was a trail running race, from what I understand, part of the drive behind organizing the event was to start linking MEC to running in general. 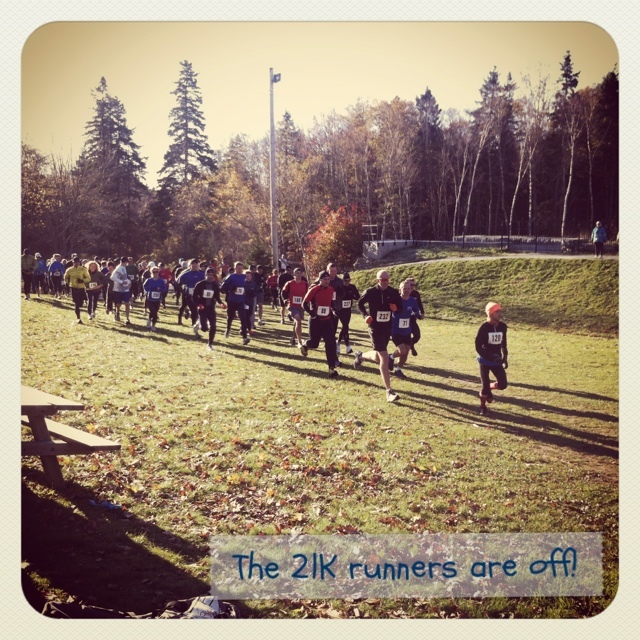 Shortly after 9:00 the 21K runners were off. About five minutes later the 10K runners followed suit. Then another five minutes after that, we (the 5K runners) were off. Sometimes, leading up to a run, I question whether or not I really want to torture myself for the next half-hour but once I get moving, I wish I could run forever. [UPDATE] According to the route retrace the time was closer to 00:06:38, which is still not that great of a pace for me. The rest of the run was well paced. I managed to bring my average pace down to 00:06:17/km, which means for kilometres 2-5 my average pace would have improved to 00:05:39/km, with which I would have been very happy. 🙂 Of course now, me finishing a 5 kilometre race in 00:29:19 with an average pace of 00:06:17/km is not possible — 5 km x 00:06:17/km = 00:31:15. Glad it wasn’t and official race because I think the people out at the half-way turn-around point didn’t set themselves up far enough. Oops. [UPDATE] Heh, heh. The half-way point was fine. The GPS app just didn’t maintain an accurate signal for the whole race. Super-oops. The Kinetic GPS app tracked my total distance at 4.66 km and, given how slow my start was, that seems to be more realistic with my time. Of course, it’s entirely possible that the tree coverage could have thrown off the GPS signal a bit and the route really was 5 km, and I really am wicked-fast, and all this math would have been for naught.